This is a clouding of the lens inside the eye, most often due to increasing age. Vision typically appears cloudy or foggy, often with increased glare and light sensitivity. Cataract Surgery – This procedure surgically removes the clouded natural lens of your eye and replaces it with a clear artificial lens implant. 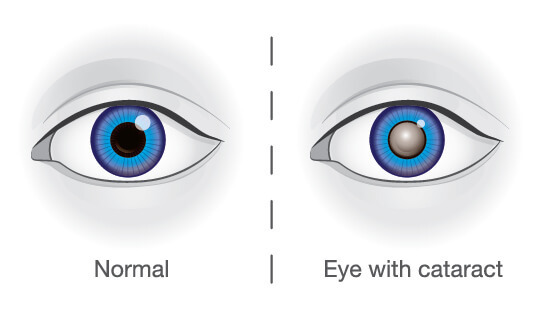 Click on the link to learn more about cataract surgery. Monovision With this option, the dominant eye is corrected for full distance vision, while the non-dominant eye is corrected to see well at near. While this concept may sound strange, most patients actually adapt well. The brain learns to depend more on the distance eye when viewing distance objects, and depend more on the near eye when using a computer or reading. The use of reading glasses may still be needed on occasion (mostly for detailed near work), but patients are not typically dependent on them. Monovision is a good option for patients who multi-task and are willing to accept a slight compromise in distance vision in order to gain near vision. However, not all patients will qualify for monovision. Our office can help you determine if this is an option for you.